For use in securing the inactive leaf of double doors. For added security, use bolts at top and bottom of the door. Deep cup for good finger hold and easy operation. Unique spring design holds bolt automatically in retracted or projected position. 5/16" diameter bolt head, 3/4" throw. O.A. Size 4"L x 3/4"W x 1-1/8"D. Polybagged. Screws included. Deep cut and double action spring combine to assure ease of operation and autoholding of bolt projected or retracted. Packed with screws. 1/2" diameter bolt head, 1" throw. 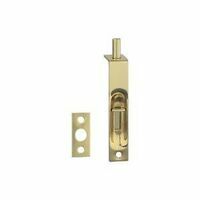 Polished solid brass faceplate and one piece aluminum rod and bolt. Specifically designed with face plate rounded for simple one-step router installation. O.A. Size: 6"L x 3/4"W x 1-5/16"D. Polybagged.